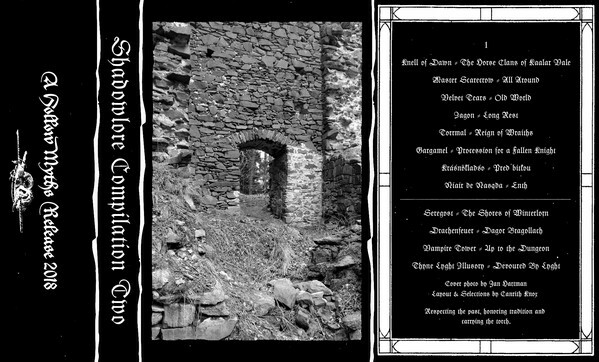 Format: An online compendium of dark ambient and dungeon synth recordings on the Hollow Myths label (USA), cat ref HM042. This was released on 21 December 2018 in an array of online formats (WAV, FLAC, MP3 etc) and it is suggested that a so-called ‘tape trader’ promo version might be doing the rounds somewhere out there too. Cover photo by Jan Hartman, layout, photos & selections attributed to Canrith Knox. Edition: Online download is unlimited. The limitation on the promo tape is unknown. Well it’s a rare treat to welcome back Drachenfeur into Honour and Darkness: as one of Hugin’s last but least productive projects (a joint band with UK ambient legend Jim Kirkwood, who has now all but ceased his musical endeavours) it’s a much missed enterprise. This is, of course, Volume Two in the ongoing Shadowlore series of online Dungeon Synth and Dark Ambient compilations. Except that there appears to be a promo tape doing the rounds too, so strictly speaking it’s not just an online project any more. Anyway, it follows on from Nazgul’s review of the first volume back in November and is equally excellent in its scope and content. The great thing about this sort of release is that it signposts you directly to the band’s own pages, where you can find downloadable goodies and merchandise aplenty. A sure fire way of emptying your wallet. Reason for update: Second copy with different book page! Amazing as it seems, the last time we had a look at the split B-Machina/Kreuzer CD release "Absinthe" was almost exactly 9 years and 1 week ago. Where on earth has that time gone?! Anyway, as you may recall from the days when Nazgul posted little updates like this, occasionally duplicate copies of things find their way into the Castle and occasionally these have subtle differences from the original release covered on the blog. Such is the case today, with this limited-to-50 copies release. Each copy came wrapped in a page from "Das Dichterische Werk" by Georg Trakl, Nazgul's first version bearing the actual book cover as its wraparound. You can see some discolouration on the page from where sunlight has bleached the paper as it sits on the spine. Strangely apposite that in a limited edition of 50 copies, this should bear page 50. Yes, stand back in amazement, it's Nazgul again: twice in a month, and on successive days no less. Wonders never cease. Today's short post is to update you about this curiosity, which featured in Honour and Darkness just after Christmas. At that time it was merely a strange compendium of Dungeon Synth and associated acts that was being advertised by Hungarian label, Translucent Black Capes. With the wonders of the internet being as they are, Nazgul successfully contacted the label and lo and behold - a physical copy of the item has now been procured for the archives. It's a nicely put together release too, with some quality artwork on the covers and disc, and a thick card front inlay. Makes a nice change from some of the more shonky d-i-y releases that pop up around the world. The plan is now to stick this in the car and give it a good listen, hopefully not repeating the disc-breaking exercise recorded in my last post. 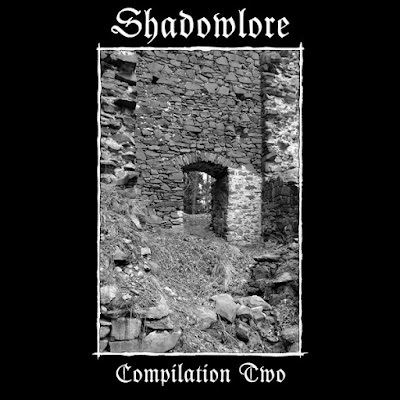 There's some interesting artists on here, some Nazgul is familiar with from recent forays into the DS underground (Algiz Dawn and Bitter Old Wizard being two) but many yet to be discovered, so it promises to be an enjoyable exploration. Format: CDr in DVD-sized case, released on the Kriastallblut label in 2015 (no cat reference). The CDr disc is deep red in colour. It hasn't been a vintage year for Honour and Darkness so far into 2019, that much is painfully apparent. A paucity of posts, and you'll all be thinking that Nazgul has fallen off his twig and that things have all but ended on the blog front. Well, let's hope that this post will help to turn the ship around. The past 4 or 5 months have been a difficult time, as regular readers will know. I lost my father near to the end of 2018, and much has had to be done since to help my mum with legal and financial matters. My day job has also exponentially increased in the amount of time I need to dedicate to it, and a growing family means other pressures of life have cut heavily into Honour and Darkness time. Indeed, this is the first year since I started this blog that I've failed to honour Hugin's birthday on the day - and on his 50th anniversary on Planet Earth too: hang my head in shame - and I even miserably failed to mark the 10th anniversary of Honour and Darkness. There's still time to join in with the celebratory 20th anniversary year of Uruk Hai though, thank goodness. The reason for all of this preamble is to explain a little (I feel I owe you all that) why posts have been more than sporadic recently. I've therefore decided to mix things up a little around here, and rather than try to replicate the lengthy and more detailed posts of yore (oh, for the days when I had time to do that) I'm getting on with things with a touch more brevity. "Thank God for that," you all cry, and who can blame you? The item you see before you today actually caused a certain amount of writer's block when it hit the death-deck, and it's been kicking around the Castle for a while being listened to in an attempt to summon the right words to describe it without sounding like a repeat of every other old-school Uruk Hai post I've put up here. I figured that if I took it with me on a business trip that I needed to make (another 6 hour car journey) your old Uncle Nazgul would be able to give it the time and attention it needed on his journey to make some better sense of it. Alas: early in the trip an entirely unforeseeable set of circumstances involving a spare tyre, a wheel jack and a poorly positioned bag led to the unfortunate result that you see below - physically breaking the disc! So not only can I not play it at all now, I have an imperfect memory of it from past plays. Hence the brevity plan (incidentally, that words reminds me that you can tell how long it has been since any meaningful posts have been put up as Nazgul has barely - if at all - referenced the Brexit shambles that is afflicting his country). What I can tell you is that the original music was recorded back in November 2014 as part of the Beleriand trilogy, and it crosses the line regularly between Hrossharsgrani and Uruk Hai soundscapes. It's definitely one for fans of the earlier, rawer period of this seminal band, and whilst not the easiest listen in the world is certainly a curio and artifact from the past. Format: Card sleeved CD compilation/sampler from the GOI Music label (Spain), cat ref ASYF002CD. There’s no date of release, though the label is now defunct and thus this sampler must date no later than 2016 and no earlier than this Hrossharsgrani song (2003). Here’s an odd one to kick off the month of February and remind you that Nazgul is still alive and kicking. It’s an entirely random compilation CD from the Spanish label GOI Music (no, I’ve no idea either) which manages to bring together some really well-known names – the likes of Marduk, Enslaved, Battlelore and Septic Flesh, to name but four – alongside some less obvious bands on this death-Viking-black-speed metal smorgasbord. Let’s be honest, it’s not happened that often that Hrossharsgrani get to rub shoulders on a CD with the some of the big boys in metal so quite what this Spanish label were smoking at the time remains an intriguing mystery, now most likely lost to the mists of time. It does make one wonder if this was an officially licenced released though, or one cobbled together without the artists knowing? One might be inclined to imagine it was legitimate in this case (though how many have we seen in the past that have a very different background) as the GOI label do seem to have a history of official reissues of older material so presumably knew a few labels across the world, one of which presumably was CCP Records of Austria. We may surmise this as Hrossharsgrani’s track comes from their 2003 release with CCP, “Schattenkrieger”. To give the song its full formal name it is usually known as ‘Krieg Entbrannte (Nacht Der Helden)’, literally translated to be ‘War Burned (Night of the Heroes)’. This was the Hrossharagrani release – as you may remember – that rather divided opinion at the time as it roped in the owners of CCP Records and turned what had previously been Hugin’s one-man Viking-drum thumping band into a far more polished symphonic affair with choirs, orchestral bits, and all sorts of gubbins. It’s this sort of random compilation that used to be the life blood of Honour and Darkness back in the day, so it’s rather nice to discover one completely out of the blue and be able to plonk it in front of you. 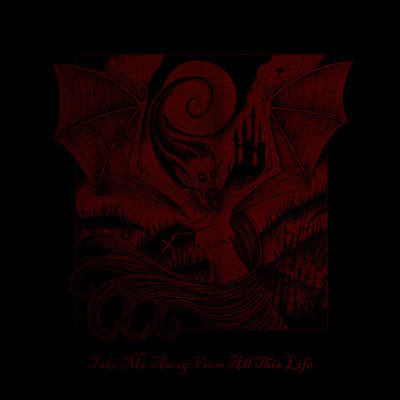 Format: Online compilation release from Translucent Black Capes (Hungary) released on 31 October 2018 on Bandcamp and as a physical release. Happy New Year to you all, loyal Honour and Darkness followers. Not yet dead and buried, Nazgul is resurrected in 2019 for at least a short period of animation to bring you this quick update. 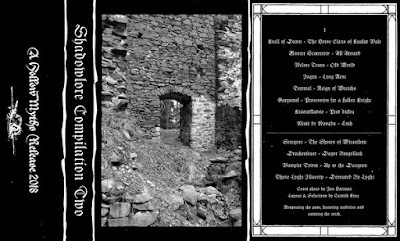 It pertains to the second compilation of "Vampiric Dungeon Synth" from Hungarian project Translucent Black Capes, which includes amongst it's assembled music an old classic from Elisabetha. Yes, it's 'Tanz Der Vampyre' from the band's 2001 release "Sterbegesange", which fulfils the brief of this particular compilation being linked to all things vampiric. "There is no life in this body. I am nothing, lifeless, soulless, hated and feared. I am dead to all the world - hear me! I'm the monster that breathing men would kill. Nice to see Elisabetha back on the Blog again, and once Nazgul's copy of the CD arrives through the post we can have an update on this post and bring them back (from the dead) once again! Should I check them out? Of course! Read on to see why! Again, it's been a while (over a month) so the now customary round of apologies for being away. 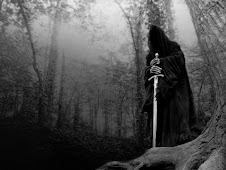 Sadly, my father passed away in November so it's been a rather difficult passage of time here at Castle Nazgul, sorting out arrangements and all of the things that need to be done. In the interim, however, the world continues unabated and today's post is really just to let you know that the Blog is still active whilst sharing some exciting news from deepest Austria, which I am repeated verbatim below! 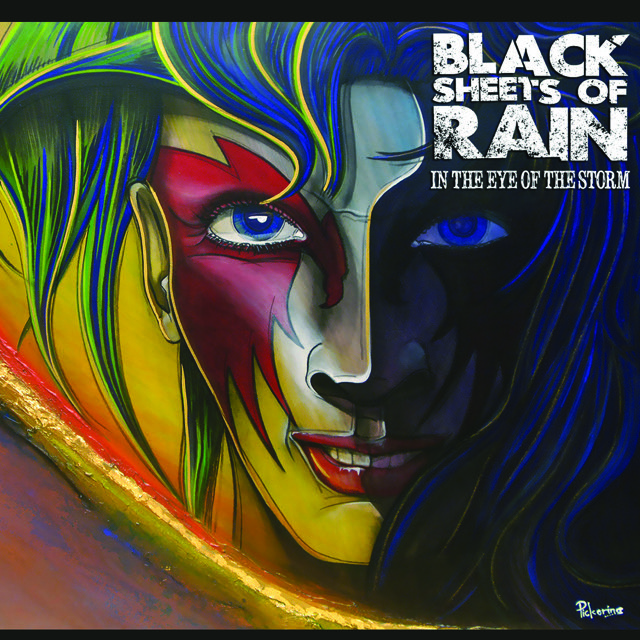 UK Heavy Metal power trio Black Sheets Of Rain​ will release their debut EP “In The Eye Of The Storm” through long-running Metal label W.A.R. Productions​ in April 2019. 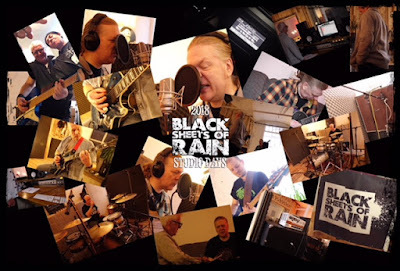 The band features Dave Nuttall (Drums/Vocals, ex Toy Dolls), Matt Lambourne (Bass, ex Solomon Groove) and Rich Davenport (Vocals/Guitar, ex See Red, Atomkraft). The EP will feature a guest vocal contribution from Davenport’s former Atomkraft bandmate Tony “Demolition Man” Dolan (Venom Inc​) on the song “No Rest,” and an introductory instrumental track by W.A.R. labelmate Alexander "Hugin" Wieser from fantasy ambient metal band URUK-HAI​. The EP was produced, mixed and mastered by Tony Wilson (Diamond Head, BBC Radio Friday Rock Show). 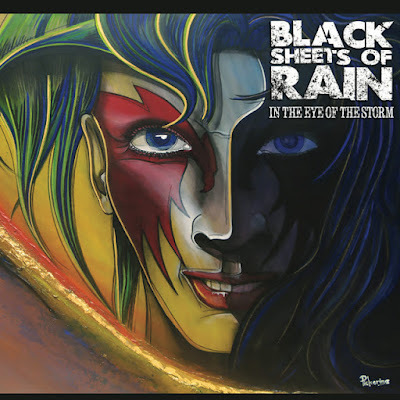 The limited edition digipack version of the CD will feature the painting “The Compensation” by acclaimed Austrian artist Dietmar Pickering / Art by Pickering​. The track Through The Storm is available now as a download single from iTunes and all other reputable online stores, and can also be streamed on Spotify. The track is featured in “Surprise,” a new horror movie from Hermitage Wanderer/Greenhouse Films, which premiered in Manchester, UK, on November 24th and will be sent to film festivals in 2019.